Delicious lamb based broth rich with barley and vegetables. Just add water and cook for one hour. Mother Mae is my husband Andrew's grandmother. She always had a big pot of soup on the hearth, and this rich broth is a tribute to her home style of cooking. It takes an hour to re-hydrate the vegetables and cook them through, so there is nothing instant about the rich lamb flavor and hearty barley and vegetables in this soup mix. Just heat 64 ounces of water, dissolve the lamb stock cube and bring it to a boil. Then add the vegetables and barley and reduce the heat to simmer for an hour. Perfect for a Sunday lunch with a whole grain bread. 4 ounces dry. Yields six eight ounce servings. Ingredients: Barley, Dried Vegetables(Potatoes, Onions, Carrots, Cabbage, Leeks), Parsley, Salt, White Pepper. The only reason this gets a 4 instead of 5 stars is because it is a dried mix as opposed to sitting in the kitchen and making it. Really surprisingly good and a definate reorder item! 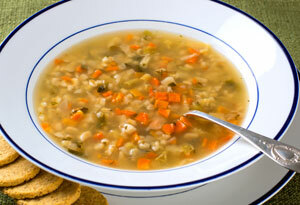 I've made this Scotch Broth several times and love it! I do "tinker" with it a wee bit. I add a second lamb stock bouillon cube, some fresh chopped onions ... and I add some lamb meat (a couple lamb chops lightly cooked, cut-up and added to the broth -- along with the bones which are removed at the end). By itself -- it's excellent ... add a little fresh onion or carrots and a little actual lamb meat -- and it becomes superb! Owner Response: Thank you for these great ideas. Add a lot of lamb and potatoes and you have a nice lamb stew, Scottish style with a clear broth. This was as a gift and they loved it. DELISH ANY TIME OF THE YEAR! This Scottish broth has the most delightful flavor of any I have ever tried. My cousin adds chicken, I don't. I like it just the way it is...super easy to make, great when you are in a pinch, and perfect any time of the year. I always have a packet on hand, or an order in the making! Easy to make. I do add meat to the mix. We really enoyed this product. I added beef neck bones to the soup to give some meat. Next time I will add lamb bones to try something different. Gave a bowl to my 80 year old Scottish mother and she enjoyed it. Enough said!